A contract-construction leader who operates in greater Washington, D.C., Derrick Sieber established his first construction company while an undergraduate at the University of Maryland in College Park. While gaining a wealth of hands-on career experience, he completed coursework to obtain his bachelor of arts in communication. Derrick Sieber’s areas of industry expertise encompass engineering and architectural design, as well as general project management and marketing. To augment and inform his professional activities, he holds active membership in multiple trade organizations, including the National Association of the Remodeling Industry. 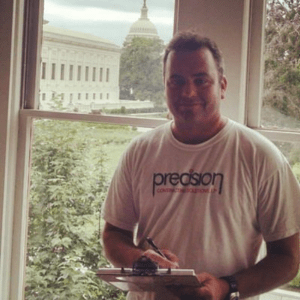 Derrick Sieber has owned and operated Precision Contracting Solutions since 2007. Precision Contracting offers services that include major home repairs, kitchen and bathroom remodels, complete room additions, and the installation of structural features that range from steel beams to concrete foundations. Under Sieber’s direction, the company uses respected brand names, such as American Standard and Pfister, in all of its plumbing work.